Helps provide relief and clear blocked or runny noses. .
Combines a cough expectorant and mucolytic to help relieve heavy chesty coughs . When used as directed Mucinex is effective in helping to relieve chest congestion so you can Coughmore productively. As advertised on TV. 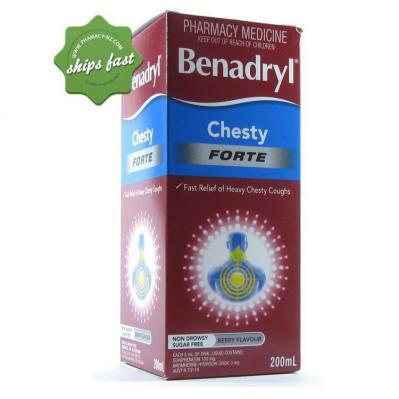 Help get relief and clear blocked or runny noses with Benadryl Liquid Chesty Forte. 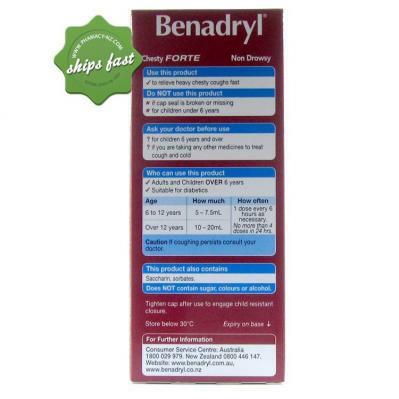 It combines a cough expectorant and mucolytic to effectively help relieve heavy chesty coughs. 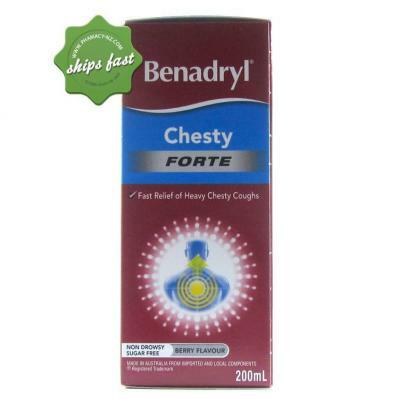 Helps to relieve chesty coughs. Helps to clear blocked or runny noses. Coughing is a natural way for the body to eliminate bad elements like germs and bacteria. Mucus or phlegm build up can easily lead to an accumulation of bacteria and possibly an infection. In order to prevent getting infections, you can take a cough expectorant and a mucolytic. 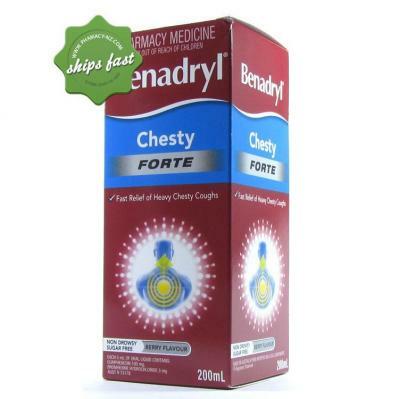 Benadryl Chesty Forte combines a cough expectorant + mucolytic to effectively help relieve heavy chesty coughs. It works two ways: the mucolytic helps to thin and break down mucus, the expectorant helps to expel mucus from your chest more easily. Children 6 to 12 years old may be given 5ml. Over 12 years old and adults may be given 10 ml. 1 dose every 4 hours as necessary. Always read the label carefully and use only as directed. If symptoms persist or you have side effects see your healthcare professional. Do not use in children under 6 years. Phenylephrine hydrochloride may cause sleeplessness in some people.